Regulars to Clarke Quay may have noticed the addition of a cozy takeaway kiosk selling puffy looking donuts on Havelock Road. 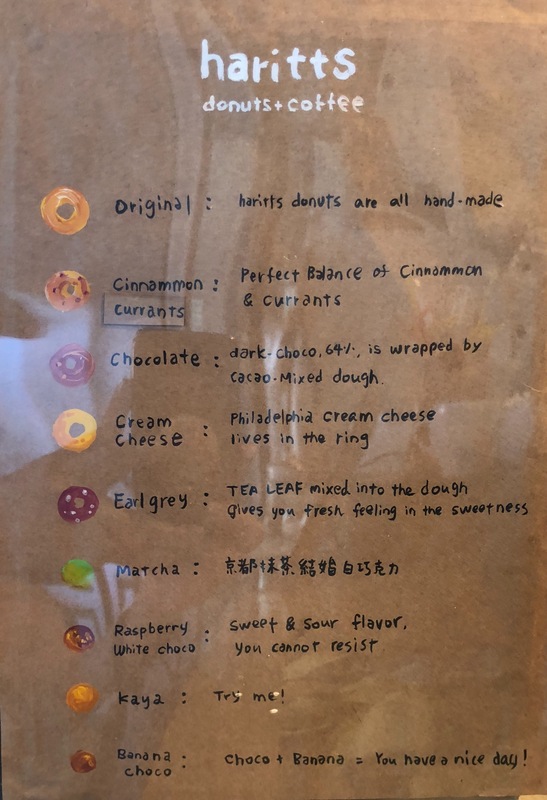 Unlike other Japanese bakeries that have opened to much fanfare in downtown Singapore, Haritts Donuts & Coffee made its Singapore debut in May, in a rather quiet, understated manner – much like its pioneer shop in Tokyo, Japan. Unlike the typical American style donuts, which are well known for their greasy dough and oftentimes generous and elaborate icing, Haritts employs a different way of preparing the beloved snack that is much healthier, yet does not compromise on taste. 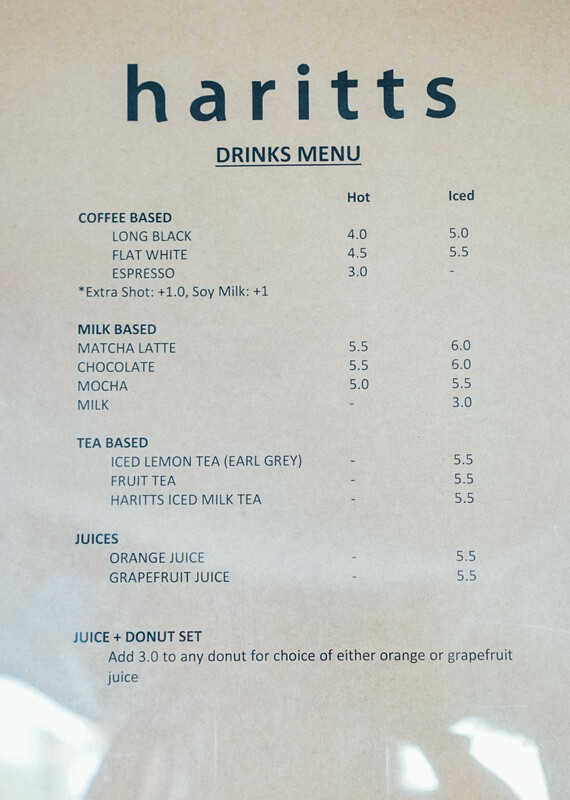 Donuts are reasonably priced from $1.90 – $3.20, depending on the flavour and ingredients used. After two to three rounds of fermentation depending on the temperature and humidity, the donuts are shaped and fried for five minutes at a low temperature, before being blotted to remove excess oil. This painstaking process that spans over two hours, produces a rather unique donut that is incredibly chewy in texture, almost like mochi. Different fillings are also piped into the dough for extra volume, like matcha and cream cheese. I had not heard of Haritts prior to visiting, so imagine my surprise when I bit into my Chocolate Donut and was greeted by the welcome taste of rich melted chocolate oozing onto my tastebuds! Seems they heeded earlier reviews about there not being sufficient filling. Biting into the dough itself was a bit like biting into mochi. As I mentioned, the texture is very unlike your usual oil-laden doughnuts; instead, Haritts’ donuts yield a rather dense and chewy texture that is also quite light and airy. Aside from ring shaped donuts, Haritts also churns out donut “holes” (traditionally made from the leftover dough cut out from the rings). I found these to be denser, but still delightfully chewy and flavourful! For an additional $3, you can turn your donut snack run into a set, complete with Orange or Grapefruit Juice. Ideal for sipping on a scorchingly hot day if you decide to consume your donuts on Haritts’ premises. Haritts may be one of Singapore’s more underrated Japanese bakeries. But considering the quiet charm this cosy kiosk exuded, I’m quite content with this remaining one of the central area’s better kept secrets. The team operating the kiosk when I visited, was friendly and welcoming, and ever ready to make their recommendations to finicky customers like me who were having trouble choosing from their range of flavours. Check back every day to see what other donuts they’re whipping up next!